A Melburnians Response to Overshoot: What is the Role of Governments? What is the Role of Governments? 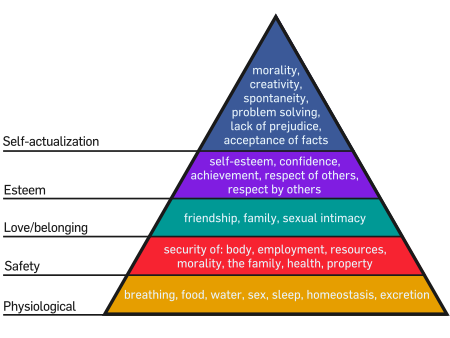 Maslow’s Hierarchy of needs is a useful concept to understand the priorities a human being has, it isn’t perfect and the order can be shuffled somewhat. I am going to examine the basic goals of government based on this concepts view. So what are the foundational goals (equivalent to Physiological and Safety) of governments? Before questions of morality or righteousness can be asked, what does a government have to do? Neo-liberalism, libertarian, objectivism etc. All say that government regulation is always bad and we should rely on the private sector for almost everything. Given that history shows otherwise, how long have governments been around? Several thousand years at least and still going strong, I can safely say these ideologies are missing important details. This isn’t to say that all government regulations are good and the private sector is useless, Soviet Russia is an example of rampant regulation, only that both need to be used and understood. A government’s first job is survival, of both itself and its people (after all, the government is normally a part of the people) and this goal is fulfilled in multiple ways. The obvious way is the sheer physical survival of its people and this task involves a few parts. The provisioning of food and water, then distributing it to the population is an iconic form of this. Many of the original governments formed around this goal, organising waterworks, actually distributing food, looking after the granaries, setting up a market system and building the transport infrastructure required. Waterworks could take generations to build and then required careful management, provided by the local government (or bigger if part of a kingdom). The failure of governments to satisfy a society’s need for food and water is normally, and rightly so, greeted by social unrest, in the form of bread riots, rebellion etc. Basic law and order is also another important role and to illustrate this I will use the Fayu, a New Guinean tribe, as an example. The Fayu used to number 2000 but reduced their populations to 400 within 1 generation due to revenge killings, using sharpened stakes and stone knives. Once a population reaches a certain density some form of conflict resolution is required and while other social structures (religion is one) can fulfil this role, to an extent, at any point Australia will be at a government will be needed for this. Justice can be carried out by any governmental form, from a council of elders to an invested judge. Another aspect of survival is that of the group and its identity, this is important because government is an abstract concept, a system and a group of people. As a social construct its survival is directly linked to a societies cohesion and mental framework, destroy this and any government will cease to exist (the lose of legitimacy is the common form). This manifests in many ways and is normally tied to other social forms; state religion, controlled press, national identities etc. These form the primary task of any government, the maintenance of internal survival. The next step up is maintaining security (from other groups) and maintaining/improving infrastructure. Organising; defences, militia, armies, supply/communication lines etc is the main way to fulfil the first of these goals. The infrastructure part comes in many forms; roads, bridges, electricity grids, ports, railways, bureaucracy, hospitals etc and this is what allows economic integration and centralisation to occur, modern corporations are completely dependent on such infrastructure. This level isn’t strictly necessary but is required for the higher levels to be achieved. This process of governments failing in their basic duties has happened before; the rise of Hitler and his compatriots was no accident and helped by the political failure of his day. The current economic and political crisis’s are currently on the path for a repeat of this pattern as the current governments refuse to implement the solutions necessary (such as a default and rebuilding of their economies for the transition and Overshoot). These basic levels of governance in the context of transition need to be figured out well before the question of democracy, morality or any of the other questions that are commonly asked of governments can be contemplated. The government systems that will survive overshoot and flourish after it need not be democratic or just, it is preferable but not necessary. If we wish for these types of governments to survive the basic support structures on which they rest must be secured or they will wither and fade away until a new form of government replaces them. Out of curiosity, do your peers discuss this stuff as you two seem to have a good handle on the major issues facing us? Maslow's hierarchy of needs is a good viewpoint with which to view the actions of others too. In any future given situation, the trick is to make yourself useful to others. Maritime engineering is certainly a good example of this. Old school navigation skills seem like a good idea too. I know too many people who are reliant on GPS systems and have lost the basic skill of reading a map, let alone looking at the sky and the terrain. Biofuels are an interesting topic too. I muck around a lot with the soil here and am yet to grow a surplus. Food really is a form of energy when you get down to basics and preserving skills are on par with making biofuels. Every year the place is a bit more productive, but it is a slow process to become resilient (as distinct from efficient). I reckon you two would enjoy a visit to their workshop! I also thought maybe about an old Lister diesel engine hooked up to a 24v truck alternator as you can import replica Lister engines made in India and they are fairly affordable and will go forever and are easy to repair. Bio-oils here would have to be either nuts: almonds, chestnuts, walnuts, but the best producing ones maybe olives. I'm trying all of them but they take years before they produce a crop and even then I don't know whether I'd have the heart to turn them into biofuels? I'm taking the easier route though and experimenting with a cheapie wind turbine generator which I'll only use for about 6 weeks of the year when the sun is too low in the sky and the photo-voltaic panels only produce about 2/3rds of the daily power if it is anything less than sunny. At least these are easily made, although the magnets are getting harder to source. There is a booming market in second hand Fisher and Paykel drive motors which you can convert into wind turbines. If I have a lot of free time then I'll have a bash at making one as they seem pretty easy to make, otherwise it'll be just eBay. Only one or two of our peers know about this, most of the grasp comes from reading and growing up with it as a basic view, i read Jared Diamonds Collapse and Guns, Germs and Steel a while ago and gone on from there. The main obstacle i found to maps was that if you didn't know what everything meant its just confusing, once i got told what all the lines meant it got easier (learnt from both Scouts and School how to read maps and compasses). A lot of old skills are like that (not all, some are also hard work and patience), once the basic principles are grasped it gets a lot easier. For biofuels, growing the food comes first and the main reason its not a good idea to immediately start production is because switching to organic methods, producing the surplus takes time and practice (i'm guessing on a range of 10 years to be reliable) and only then can they be produced, once the transitions done i expect most farms will produce some but during, depends. The wind turbines probably the better option now, the main advantage of biofules is the ease of storage (compared to solar and wind). While wind and solar are interrmittant, you know they'll pick up at some point, so using biofuels as a bridge between downtimes seems the best use. e.g I saw you mention on the Archdruid report that you needed to burn (20?) litres of petrol, instead you'd use biofuel saved over the year/s and would eventually have a tank you could use when neccesary (100 litres or so?) and sell any extra. You'll probably find that bio-oils will be farmed extensively as canola or similar while farming intensively/small farms as nuts or olives will be used. If you ever decide to try, http://www.dpi.vic.gov.au/energy/sustainable-energy/bioenergy here has some examples on large scale projects and hopefully http://bioenergyvictoria.net.au/home/ will have some applicable projects, if not there should be information available somewhere. How Will the World’s population die?